Arlen Bankston and Brad Stokes chat about how HR can support a journey into an Agile environment, supporting the team, metrics and using HR as a stepping stone to transform an entire organisation. 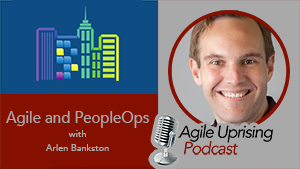 It is Agile and PeopleOps with Arlen Bankson. Arlen is one of LitheSpeed’s two founders and owners and has been actively involved in the application and evolution of Agile software development processes such as Scrum, Kanban and Extreme Programming for over a decade and a half. He is also a Lean Six Sigma Master Black Belt and was an early adopter in the application of broader lean principles to agile methods to deepen theoretical understanding and drive organizational change.